Montana 1948 is a quietly powerful story, one that doesn't need a lot of bravado to tell its tale, but one that still packs a mighty punch that will leave you setting the book aside and taking a moment to think about it and what it means. It is a coming of age story, but not only for the narrator David Hayden, but also for his mother, his father, his family as a whole. David discovers that life is not always quite black and white, his mother proves her strength, his father finally stands on his own, learning the difference between the loyalty of family and his loyalty to the law. The Hayden's housekeeper, Marie, falls ill and when David's uncle, Frank, is called in to check on her, it is discovered that Frank has been molesting his female Indian patients. A war hero and member of the respected Hayden family, it is hard to believe that Frank has done these things, and his brother, David's father, the sheriff, has a harder time deciding what to do: be loyal to his brother and try to keep the secret quiet or uphold the law and take his brother into custody. David's grandfather, the previous sheriff of Mercer County, doesn't make things easier, thinking his clout in town will be enough to keep his son safe. What follows tests and proves the strength of every member of the Hayden family. 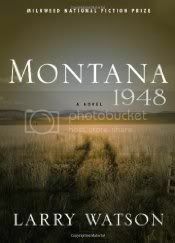 Montana 1948 is not a very long book, but tells a story that fills its pages to brimming. It won't take you long to read it, but I'm pretty sure you'll be thinking about it far after you've moved on to other books. I'll be on the lookout for more by Larry Watson in the future.